Low Price Adjustable Duet Artist Bench - Free Shipping is rated 4.37 out of 5 based on 60 ratings. The least expensive adjustable artist bench with music storage on the market! Perfect for children!! This bench measures 13.5 x 29.5" and adjusts 18"-21.5". Plus it has a music compartment 2.25" deep - lots of room for lots of music. 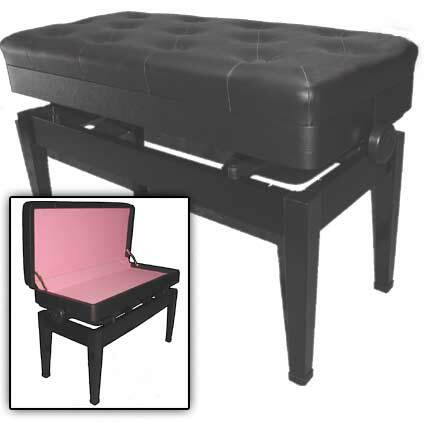 Topped with a plush comfortable tufted vinyl, it has hardwood sides and black steel legs. Classic looks, practical, and at the perfect price.